I’ve been trying to get a decent image of Jupiter the last couples of weeks fighting clouds and a lot of technical problems. When I finally got the telescope and the finder scope aligned and the focus right using a crater on the moon and started to getting AVI-videos, I was disappointed in the low-quality rating Auto Stakker 2 gave on analyzing them. For three nights, I tried with different settings unable to improve the quality. Admittedly on the laptop screen, Jupiter was boiling in in the sky probably because it was more than 4 degrees below the horizon. A year ago Jupiter was almost 10 degrees higher. 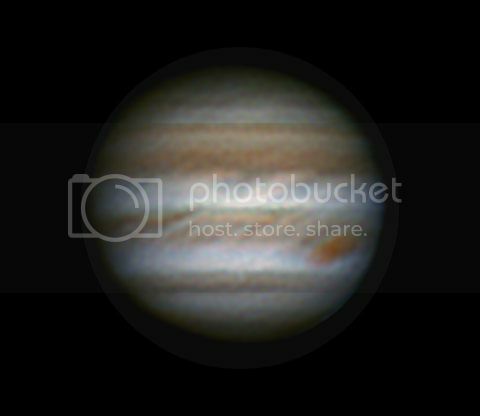 The videos where no longer than 130s to avoid the fast rotation of Jupiter blurring the image. I used the Carbon Newtonian 305/1500mm with the ZWO ASI120MC Camera with a 3x Barlow. Processing was done with AS!2, RegiStax 6 and Photo Shop.